The modern passion for Princess Diana memorabilia and Queen Mum tea cosies is nothing compared to the knick-knacks produced for Peter the Great's visit in 1699. 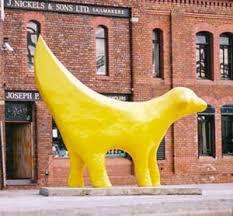 By the time you read this, a giant yellow concrete lamb with a banana-shaped body should already be perched conspicuously above Liverpool's Mersey Tunnel. The Henry Moore legacy runs deep and wide through the hearts, minds and bank accounts of the British art world.